google-site-verification: google8d8438b214143f71.html Beautiful Quotes: Don't Judge Anyone Because Everyone Has a Different Story! 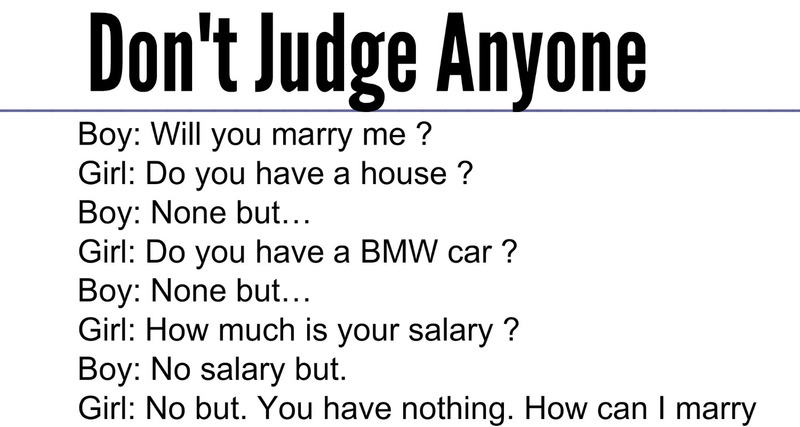 Don't Judge Anyone Because Everyone Has a Different Story! Boy: Will you marry me ? Girl: Do you have a house ? Girl: Do you have a BMW car ? Girl: How much is your salary ? Girl: No but. You have nothing. How can I marry you? Just leave me, please! How can I get the salary when actually I’m the BOSS.